With technology becoming more advanced across all mediums and the demand for content growing, work abounds for those in the animation job market. There are many offshoots of animation work to pick from in the industry. Film production studios need animators, whether it be for full-on animated films, or for CGI and special effects on live-action movies. The video game industry needs animators to help render concepts both inside and outside of their games. There are even jobs in scientific and technical industries. Without a doubt, some locations lend themselves much better to a career in animation. This article takes a look at what you can earn, and where you can earn it, in the animation industry. According to the Bureau of Labor Statistics, which updated their numbers most recently in May of 2015, the median pay for workers in the field was $63,970.00 per year. The field they refer to includes both animators and multimedia artists. The term “median pay” means that 50% of workers in the field earned less than that number, and the other 50% of workers earned more than that number. The Bureau of Labor Statistics mentions that in a survey they conducted in 2014, a little over 50% of animators were self-employed. The median pay per hour from 2015 was $30.76. Keep in mind that these numbers reflect the entire country. You can use a tool like this payscale salary calculator to look at more specific data. It lets you choose parameters like location and experience, and shows you some average salary data. 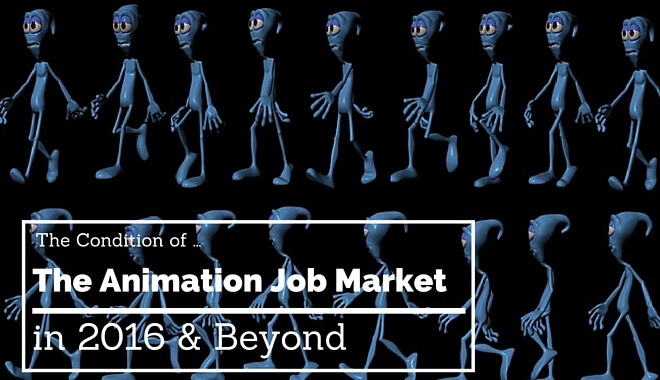 According to research conducted in 2014 (most recent available for this data) by the BLS, there were 64,400 jobs in the animation field, and they project almost 4,000 more jobs will be added to the industry by the year 2024. This is about a 6% increase in jobs, which is just about on par with the national average for industry growth (which is 7%). Most aspiring animators enter the industry with a bachelor’s degree in computer graphics, animation, or other related fields. Typically, the entrants into the industry do not have job experience in a related field. What employers look for instead is a strong portfolio, created while the potential employee earned his or her degree. The BLS also notes that on-the-job training happens pretty consistently. Any new employees can expect training in the company-specific software. Fear not, novice animator, all software secrets will be revealed! In nearly every continental state (and Hawaii!) you can find an animation or multimedia artist position. Obviously, some states will play host to a greater percentage of these jobs than others. (At least) two of those states probably jump out as obvious: New York and California. They are the two biggest film and television production cities in the country. California takes the top spot in both cases. It’s not surprising when you consider that California is home to some of the biggest names in animation. For more statistical breakdowns, check out this map provided by the BLS. It adds a state-by-state (and even area-by-area) breakdown of its salary and employment data. Even if you’re just getting into the animation scene, you’ll recognize some of these California-based studios from a consumer standpoint. For example, everybody knows Pixar! They consistently release some of the most financially successful and critically acclaimed animated films (with a huge recent cinematic win being Inside Out). Pixar is located in Emeryville, CA. Emeryville is located in the San Francisco Bay Area. Not interested in working for Pixar? How about another VFX and animation studio powerhouse? Industrial Light and Magic calls San Francisco home. George Lucas founded this studio back in 1975. As such, the studio has worked on the effects for every Star Wars film. It’s also responsible for the work on the new Warcraft film in production. Not a San Fran fan? You could look into Walt Disney Animation Studios, located in Burbank, CA (About 12 miles northwest of downtown Los Angeles). There might be some animation-origination confusion around the distinction between Pixar and Walt Disney Animation Studios, since Disney acquired Pixar in 2006. But they have remained separate entities. Walt Disney Animation Studios were responsible for movies like Frozen and Big Hero 6. Cartoon Network Studios, Nickelodeon Animation Studios, AND Warner Bros Animation are all located in Burbank, CA as well. There are many more, too. That’s just the tip of the CA iceberg. You can see how California would be a hotbed for animators, especially those interested in pursuing careers based around television or film animation. Just because California has the highest annual mean pay and highest employment numbers for the industry, doesn’t mean it’s the best place to go. With numbers like that, the market could be heavily saturated with aspiring animators. Meanwhile, there are hundreds of game developers and animation studios located outside of the California hotbed. Check out this 2014 list of 100 most influential game studios. That’s just the top 100. See what we’re saying? There’s a lot of opportunities out there! There are studios outside of the United States if you’re interested in pursuing that route. France, England, Japan, etc. are all home to top global animation studios. Start by doing some research into a handful of your favorite studios, whether they’re video game-based or animation-based. Figure out where they are located and whether or not they’re hiring. Don’t forget about the salary calculator tool. Of course, annual pay shouldn’t be the only thing you consider. If there is an opportunity out there to work on a project you really love, even if it’s for less money than another offer, you might find it more fulfilling. There are plenty of resources out there, some of which we pointed you to with this article. By doing the research and getting informed now, you’ll have a leg up on your competition. What are the Best Animation Studios in the World? What are the Top Animation Schools in The US? Animation vs Video Game Design: What’s the Difference?